If you’ve been on the internet at all this week, you probably know that Apple launched a bunch of new devices. But the most shocking announcement wasn’t the new iPhones, redesigned Apple TV or fancy new Hermès watches. It was a version Microsoft’s Surface – or at least something that looks a lot like it. Of course, I’m talking about the iPad Pro, which Apple touts as having desktop-class computing power and can be bought with a keyboard cover and – *gasp* – a stylus (which Apple calls a Pencil). More than just being a giant tablet on steroids, the iPad Pro is a watershed device for Apple: for the first time, the company is purposefully blurring the line between its tablets and laptops. Up until now, iPads were largely about media consumption and the occasional essay on the go, while you turned to a MacBook for anything you’d consider “serious” work. For the average user, there was never really a question about which one they should buy. Things are different now. By flaunting processing power and officially throwing its weight behind productivity-oriented accessories, Apple is implying a vision for computers not too dissimilar Microsoft’s: tablets that can can replace our laptops. That’s not to say the traditional laptop will go away anytime soon – I doubt even Microsoft wants that – but the iPad Pro proves a Surface-like form-factor has a real place in today’s market. The iPad Pro is supposed to be thin and light enough to take practically anywhere, but still powerful enough to do most of what you can on a laptop. That’s exactly the versatility the Surface and Windows 10 are meant to enable. Apple may have chosen its mobile operating system as the foundation rather the desktop one, but the end goal is the same. Of course, the iPad Pro can’t do everything Microsoft’s Surface or a proper laptop can right now. It still runs iOS, so it’s missing out on the myriad of industry-standard OS X and Windows 10 apps. That being said, the transition was likely inevitable. Tablet shipments have slowed significantly over the past couple of years, so Apple was forced to make a more useful iPad – especially now that phones are big enough to be mini-tablets in their own right. Microsoft noticed that trend before anyone; it just tripped up trying to get ahead of the game. 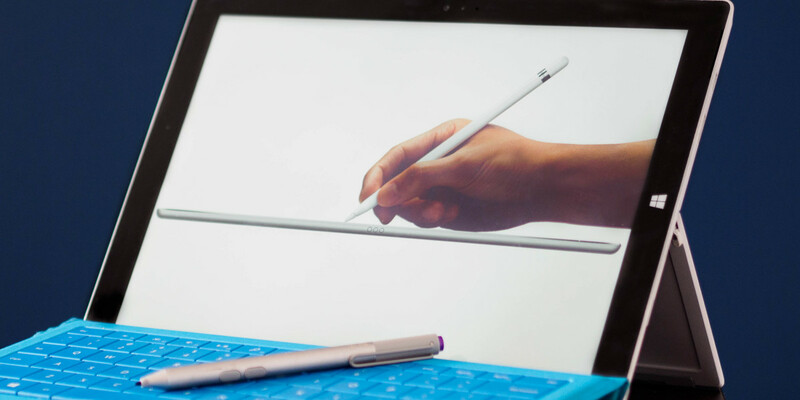 The iPad Pro and iOS 9 are simply what the Surface and Windows RT could have been if Microsoft had gotten it right. Of course, whether the iPad Pro will really boost tablet sales remains to be seen, but it’s hard not to imagine it cannibalizing MacBook sales. If not immediately, then certainly within a generation or two. For the first time, I really think iOS could come to replace OS X for the the everyday user. Students, the enterprise and Mr. Average Joe are likely to find the convertible form-factor to be more versatile and convenient than a traditional laptop and more powerful than a regular tablet. It’s something every Surface user already appreciates, especially since Windows 10. And unlike the Surface, Apple won’t suffer from a scarcity of touch-friendly apps at launch, and the iOS has been around long enough that there are already plenty of productivity and creativity apps available. All the tablet was missing was the precision hardware and an OS with proper multitasking. It’s easy to poke fun at Apple for copying Surface features after all this time, but the iPad Pro will ultimately mean good things for Microsoft fans too. Competition between the two tech giants will incite better hardware for everyone and more importantly, Apple’s mindshare means developers will see more benefits to creating software for the convertible form-factor. The iPad Pro suggests Microsoft was right about the Surface all along, but Apple joining the game will mean better tablets for everyone, no matter which side of the fence you’re on.